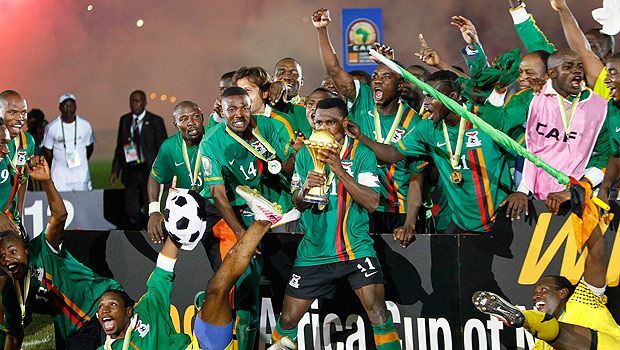 On a weekend when Thierry Henry reminded us that football can occasionally be scripted, a far bigger story was completed in Libreville, the capital of Gabon, as Zambia were crowned, most audaciously, Kings of the African continent. Almost two decades on from the tragic airplane crash that robbed them of a generation of players of whom so much was expected, that their tragedy had come full circle in the same country that that dreadful event occurred makes it all the more special. 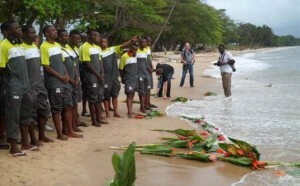 On 27 April 1993, a Zambian plane carrying the national side to Senegal for a 1994 World Cup qualification match crashed above Libreville, killing all 30 passengers, including 18 players and a number of coaches. A generation of Zambia’s finest football talent had been annihilated. 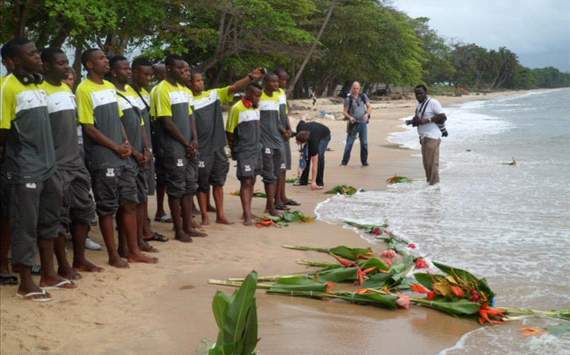 Last Thursday the Zambian players had led a sombre ceremony laying flowers on a beach near Libreville to commemorate their fellow countrymen ahead of the final. In Lusaka and amongst the Zambian diaspora there was much talk of the need to remember the fallen of players of â€™93, and that a possibility of a first triumph at the Nations Cup was somehow fated. However, Cote dâ€™Ivoire too must have felt that this was to be deservedly their year based on the past too, although far less tragically. They have lost out in the final in recent memory and have been beaten most notably by Egypt to a title that many outside spectators would have tipped them to win at least once with the generation of players they have had. This looks to be the last hooray for some, Didier Drogba is almost 34, Kolo Toure is turning 31 in March and this tournament lacked some of the big guns that have stood in Cote dâ€™Ivoireâ€™s was previously. Perhaps it was the pressure of their fated final triumph that made them stutter, coupled with the fact that Zambia, popularly knows as Chipolopolo (the Copper Bullets)Â had played freely under Herve Renardâ€™s guidance and the shackles were clearly off in a game in which they had nothing to lose. In the final, it was clear that pressure had got to Cote dâ€™Ivoireâ€™s captain as Drogba cleared the crossbar with his countryâ€™s best chance to take the lead from the penalty spot. Counter this with the performance of Zambiaâ€™s captain, Chis Katongo and his fellow forward and man of the moment in their semi-final Emmanuel Mayuka, whose flamboyance and drive caused endless problems for the Ivorians. 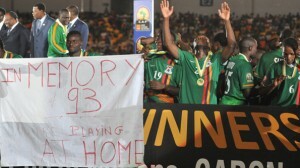 Defensively, Zambiaâ€™s back line of anonymous stalwarts kept Cote dâ€™Ivoireâ€™s household names at bay with relative ease. Stoppira Sunzu in particular defended impressively and converting the winning penalty. Joseph Musondo had added to the final’s drama after he was injured tackling Solomon Kalou and departed the pitch devastated, knowing that the biggest game of his career had ended prematurely. The pictures of his manager,Renard, carrying his stricken player across the pitch to the team celebrations after the penalty shoot-out was a classic moment in football history, a point probably not lost on Renard. The man widely considered Chipolopoloâ€™s best ever player, Kalusha Bwalya, was embraced by the entire squad after full-time having watched the game from the stands. It is not only his stature in Zambian football fokelore that made this moment relevant, but also that he is the sole survivor of the â€™93 team. While all of his team mates lostÂ their lives nineteen years ago he was making his own way to represent his country from club duty with PSV Eindhoven; his presence however, was not the only one from that team to be in the stadium on last Sunday according to many in Zambia. The team of â€™93 were expected by many to be the Chipolopolo team that would give the nation memories of sporting fiction made reality, the team of 2012 has done so much more. Not only has this cup given Zambia the sporting prowess that they thought Bwalyaâ€™s team mates would deliver two decades ago, they have laid to rest the ghosts of those who died in the most poetic fashion possible.